Rachael Ray made a big move this week - she switched book publishers. Rach published nine books with Random House's Clarkson & Potter (and more before that with Lake Isle Press). She has now made the move to Simon & Schuster's Atria Books. It's a three book deal, so we know at least that many will be coming out in the coming years! The exciting part about this move for fans is that Rach says that her new cookbooks will be "exciting for people using their Nooks or iPads," according to The Hollywood Reporter. I guess I have to get a Nook or iPad now because I don't want to miss out on the fun. Hold on a second while I go update my birthday wish list. . . . .
And the even MORE exciting part is that we get the title for her next cookbook, to be published in June: The Book of Burger. It will be accompanied by "10 digital 'quick response' bar codes which readers can swipe on their smart phones to pull up links and videos online." 1. An entire book of Double Duty/Rollover menus, like this one for Turkey-Stuffin’ Meatloaf With Scallion Mashed Potatoes & Gravy that gets turned into Enchil-Lasagna the next night. 2. An entire book of recipes that will last a month, like this feature in Every Day with Rachael Ray. It's hard to find a month's worth of recipes that aren't filled with cream of chicken soup and ranch seasoning packets. 3. 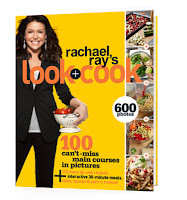 I'd also love a crock pot cookbook, but I haven't seen many of those recipes from Rachael. With two kids, the crock pot and I are becoming good friends, but it's hard to find recipes that aren't full of junk. What cookbook would you love to see her write? I second you on the crock pot recipes. Would also love to have a cookbook featuring her week in a day recipes, which are also perfect for busy moms. Good call on the Week in a Day cookbook. I would love to see that, too. Great to hear Rachael's books will be going digital with the new publisher. It's a big bonus in today's world since physical books take up so much room once you have lots. Crockpot recipes are a big hit for me too since they're great to put on in winter.